Yes, a grow tent. Have you ever heard about it? No? Let me explain. A grow tent is an indoor ecosystem where you control the weather. A grow tent is a box-like structure which provides an ideal indoor environment for the trees to grow. A grow tent is another name for a grow box which provides a suitable growing environment for different plants as same as grow box does. The grow box is different on the basis of stronger and permanent components while the grow tent use have a fabric instead of powder coated aluminum. 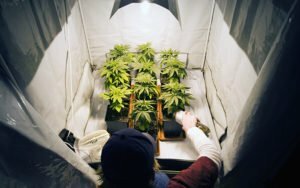 Setting up a grow tent is not cheap anyway even the basic requirements are costly but the advantage is that it is away from all the natural challenges and roadblocks. It is slightly more complicated than growing outdoor but the result will be a lot better. It is daunting to provide a proper condition to cannabis to grow as the cannabis are not suitable plants to grow at home the production might be 5 ounces a month the production is however not near to mass production but it’s the best one can get keeping it simple. The first step is the seed buy it from any nearest store it will cost you about 10$ make sure you take the seeds with tiger strip pattern or it could be dark but white or pale green are worthless and dead. Place them for germination. Moist the pallet so it can expand place the seeds ½ inch deep and keep the pallet moist it is suitable for the seed to sprout in 3 to 7 days. Keep the seeds in the pallet to grow but make sure they have accurate light. Give your sprouted seeds a daylight of 18 hours and 6 hours of darkness until they are 3 ½ weeks old. After they reach 3 to 3 ½ week give them 12 hours of sunlight and 12 hours of darkness it will start their flowering stage. Keep the seeds in the pallet for all these processes and use LED light for lighting as it gives light consuming less electricity and can save you if you are growing cannabis in a restricted area. Air circulation is another major factor so provide air with a fan or other method. Fabric pots are the newest form of pots they are suitable as they allow the roots to breathe and drain. Use organic soil as it gives the best flavor cause remember you were growing for human consumption so don’t use junk to row your cannabis. Use a filter for watering the plants as the filter will give water with fewer chemicals. Use an odor control system which would be essential after a couple of months of the flowering of your plant as it gives strong odor then. Use comfortable garden shears and cut the plants way too carefully. It is a good way to grow your initial plants after that you can also put them into an outdoor area for their roots to grow.